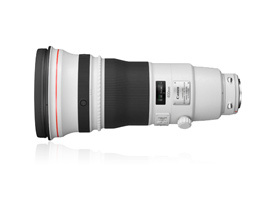 The Canon EF 400mm f2.8L IS II USM is a completely uncompromising ‘Super Telephoto’ lens built to fit Canon’s full frame cameras (it will also fit its APS-C cameras, on which it has an effective focal length of 640mm). The design consists of 16 elements in 12 groups, including some fluorite glass. There is a ‘Subwavelength Structure Coating’ to reduce flare and a fluorine coating on the front and rear elements that makes cleaning easier. There is provision for internally mounted 52mm filters and for Gelatin filters too, this is just as well since the front of the lens is 163mm across, virtually ruling out using front mounted filters. The length is 343mm and the weight is 3850g: about the same as a new born baby! The physical specifications of the 400mm f2.8 are complements with a wide range of operational features too: Image stabilization that allows for operation in 3 modes, 4 if you include ‘off’. The variations allow you to optimize the IS for shooting still subjects or moving subjects whilst panning. There are also options in focusing: Auto, using a USM motor, or Manual plus Power Focus, a smooth powered system primarily aimed at video users. Additionally you are able to preset a focus point to which the lens will snap whenever you ask it to or you can limit the focus to narrower ranges to ensure that it works as quickly as possible. It is evident from the high proportion of professional sports photographers using Canon cameras that Canon has made a range of ‘Super Telephoto’ lenses that address the needs of this rather demanding group. The Canon EF 400mm f2.8L IS II USM is one of the sharpest Canon lenses scoring 21 P-Mpix when measured on a Canon EOS 5D Mk III. This negligible difference between the sensor Mpix and the perceived sharpness is excellent. All of the measurements are good: the transmission is very slightly slower than stated; there is one tenth of one percent distortion! Too little to see and vignetting at 1.1EV is manageable, easily fixed with DxO Optics Pro. This is a top quality lens. The perfect result for a lens built to be used wide open: good throughout the range but excellent at f2.8. From one point of view choosing something to compare to the Canon EF 400mm f2.8L IS II USM seems a little pointless, if this is the type of lens that you need then nothing else will do. There are alternatives, Nikon has an equivalent, their Nikkor 400mm f2.8G ED VR AF-S, DxOMark has not tested this yet, but you would not be looking at this lens against the Canon unless you were starting completely from scratch. 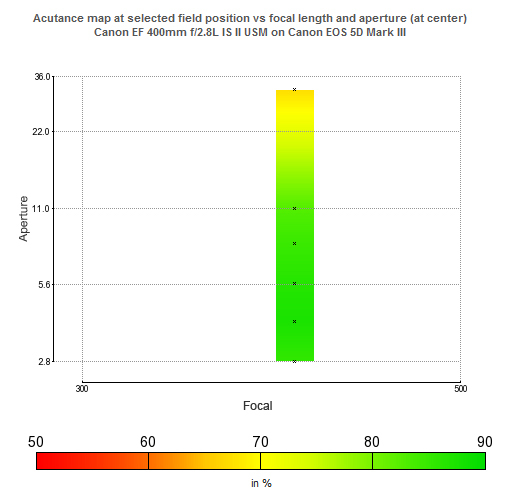 Canon actually has 3 current models of 400mm lens; the others have maximum apertures of f/4 and f/5.6. Neither of these has been tested at the time of writing but clearly they will not have the same crisp, shallow depth of field which makes these fast telephoto lenses so special, though they are very much lighter, the f/4 weighs 1940g and the f/5.6 a mere 1250g. Canon also has an EF 300mm f2.8L IS II USM, again, the shallowness of the depth of field will not quite compare to the 400 but it will be pretty close and with a weight of just 2400g it is obviously much more manageable. The operational features of these two lenses are identical; indeed they share an instruction manual. The optical design is similar too with 16 elements in 12 groups. Both of these lenses are excellent with DxOMark scores of 30 for the 400 and 32 for the 300. 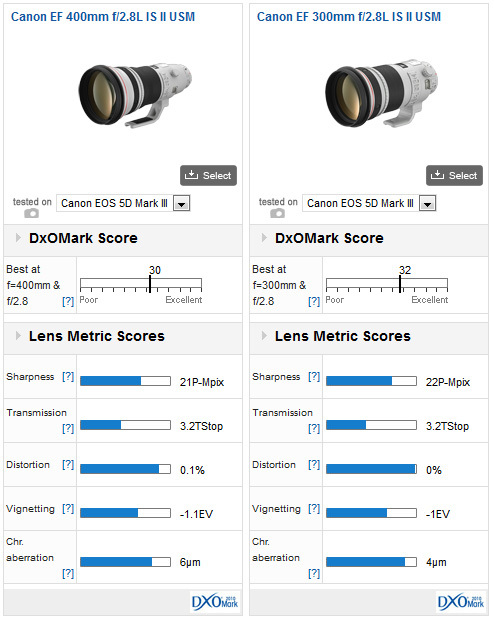 Sharpness, when measured on a Canon EOS 5D Mk III is 21 P-Mpix for the 400 and 22P-Mpix for the 300, the two highest scores achieved for any lens mounted on this camera. Drilling deeper into the scores is like looking at two sets of results from the same lens, distortion is negligible, chromatic aberration is well controlled (slightly better on the 300) and vignetting at around 1 stop when either lens is used wide open. If you want to be really picky, strictly the 300 is better, but if you need the length then the 400 is only just behind. There is very little to differentiate between these two very good lenses, except the focal length. If you need a wide 400mm lens for your Canon camera and you can afford it – and you can justify it – this lens is one of the sharpest DxOMark has tested on a Canon camera. It is big, it is very heavy, (though lighter than the Nikkor!) and it will require real skill to exploit the amazing effect that an aperture of f/2.8 can give on such a long lens, but it is very unlikely that you will be disappointed.